Russell Westbrook's contentious relationship with Utah Jazz fans hit a new level Monday when he threatened two people during a break in play in Monday’s game. Video captured a heated Westbrook and was posted on Twitter. The language in the video is not safe for work. “I’m gonna tell you one thing. I’ll f—- him up,” Westbrook tells somebody standing off camera. Westbrook then turns his attention to the person at the receiving end of his ire. “I promise you,” Westbrook continues. “You think I’m playing? I swear to God. I swear to God. I’ll f—- you up. You and your wife. I’ll f—- you up. Westbrook addressed the interaction after the game in a statement to the media. “The realization of it is — how it started was — a young man and his wife in the stands told me to ‘get down on my knees like you used to,’” Westbrook said. “To me that’s just completely disrespectful. To me, I think it’s racial, and I think it’s inappropriate in the sense that there’s no protection for the players. Westbrook’s teammate Patrick Patterson also discussed the incident after the game on Twitter. Salt Lake City’s KSL caught up with the fan who said he was on the receiving end of Westbrook’s tirade after the game. Shane Keisel called Westbrook “classless” and said he never swore at Westbrook during their interaction. “He’s gotta be a professional. She was sitting down the entire time,” Keisel said of his wife. “It was actually kind of having fun, to be honest. He was smiling at one point. Keisel went on to say that his wife was never involved in the interaction. 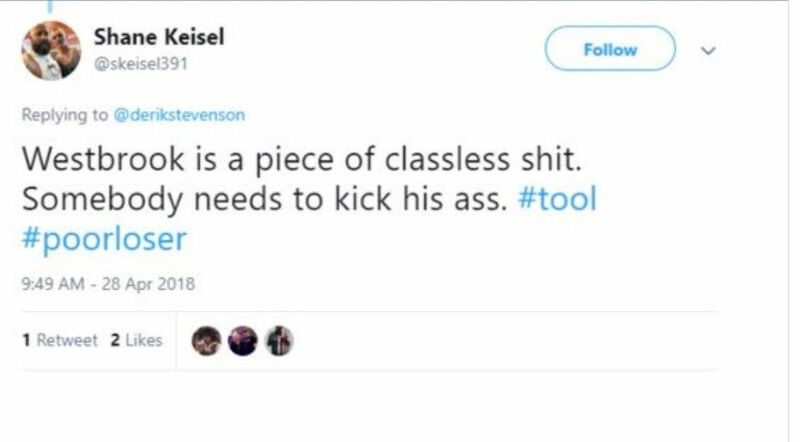 Monday was not the first time Keisel has called Westbrook “classless.” He did so as well on Twitter during last year’s heated playoff series between the Jazz and Thunder. Keisel’s Twitter account was protected after Monday’s game. The Jazz released a statement after the game that fans were warned by security and that the incident is under investigation. “We are continuing to investigate the unfortunate exchange at tonight’s game between Russell Westbrook and fans,” the statement reads. “Multiple warning cards were issued by arena security. Players and fans have a shared responsibility to create a safe and respectful environment. Westbrook has a public history with Jazz fans dating back to last year’s playoffs when Utah won a hotly contested first-round series over Oklahoma City. He had two altercations with fans in the deciding Game 6 of that series, one that saw him swipe at and exchange words with a fan holding a camera as he walked off the court after losing. Westbrook also yelled at a fan who confronted him at the tunnel at halftime of the same game. After that playoff loss, a frustrated Westbrook told reporters that fans in Utah are disrespectful and bring up players’ families when talking to them. Things in Utah appear to be only getting worse between Westbrook and Jazz fans. His comments and the reports of what Keisel said to him will surely catch the attention of the NBA, which has a growing problem with negative fan interactions between fans and players. Fans have access to NBA players like in no other sport, with seats extending down to the same floor that players play on and no barrier in between. Barring a playoff matchup, Oklahoma City’s 98-89 win Monday will be the last time these two teams face each other this season. The Thunder are currently slated for the No. 4 seed in the playoffs, while the Jazz would be the No. 6 seed if the postseason started today. But a small swing in the standings either way could point to a rematch of last season’s first-round series.